...No, not quite - there are no craters from the battle of Verdun in the photos above and below - but they are craters alright. 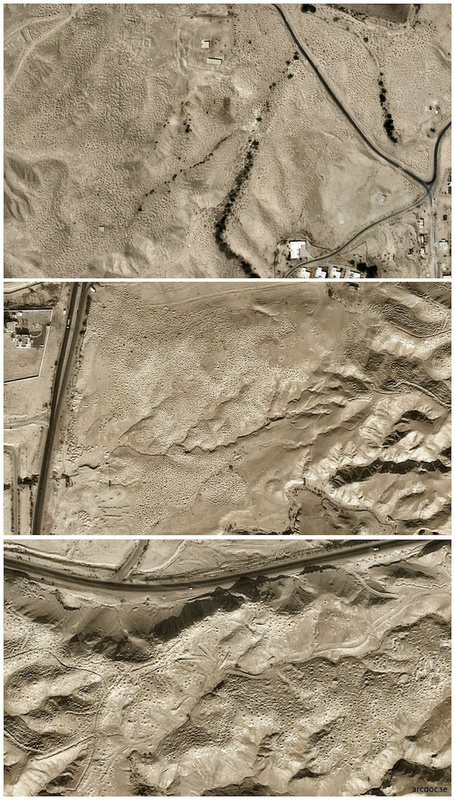 These photos shows some of several localities on the southeastern shores of the Dead Sea - places where ancient tombs have been looted on their content since some decennia. Each little heap of soil or pit that you can discern in the pockmarked pattern below, is the remains of a previous sealed tomb. These were meant to be an asylum for the deceased for all eternity – with the forced exception of any curious scientist, usually referred to as archaeologists. Unfortunately (or should we say, luckily) the latter category were not involved in the activities shown here and the illicit excavations advanced a long time before ISIS entered the market elsewhere. These gravesites mostly originate from the Early Bronze Age period as well as the first and second centuries AD. The eyesight is an archaeological nightmare where the individuals that buy and sell antiquities are all to blame. The diggers themselves on the other hand, were residents in one of the poorest areas of Jordan and acted accordingly. In a short perspective the protection of an ancient pot cannot be concidered more important than supporting a family in need. This is a perfect example where awareness within the realm of cultural heritage could have secured both the past and the future in order to reverse the trend. In a longer perspective archaeological sites could instead, through local knowledge of the past, have contributed to an income through tourism. It’s always easy to be wise after the event – but let it at least be a good lesson. The relatively newly opened Lot’s Cave Museum in the same region, is a much appreciated and important step in the right direction.